Photographer’s Note: I read today that Photo Blogs should have BIG images so I have changed the layout to allow for bigger sized versions and updated all past views and postings. However, this layout moves what I call More Stuff from the top of the page navigation bar to a box on the sidebar (those things going down the right hand side of this page). Please, take a few minutes to check out those pages and visit my growing list of Favorite Blogs. 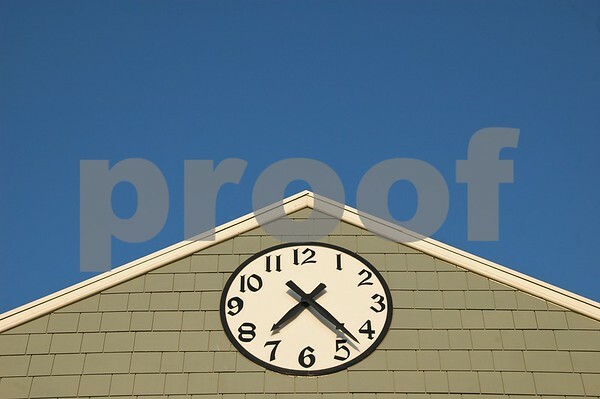 This entry was posted in Weekly View and tagged baldwinsville, blue, clock, face, new york, sky, time. Bookmark the permalink. How does a photographer see time? Is it found in the variation of light we perceive? I love the conflict in your photo. How can it possibly be 7:23 am or pm with that cerulean sky? Excellent photo. Since Time is a concept and not a thing like a clock is. Trying to photograph “time” is a challenge. I did not do any post-processing of this photo and, yes, that is how the sky looked that day. Thank you for your kind words, morningjoy! Oh Wow – I’ll be back!! Oh, I see, I’ll add this one to my list as the doorway to your other wonderful blogs. I was just thinking I’d add yours to bring a touch of pizazz to mine! Don’t even ask how many blogs…. Scott – needed a last minute rethink on the blogs, so the previous nexii link wont work. Look for Virtual Voyage – see current avatar link. Cheers – a profile link hadn’t been amended; should work now.